Beef: Our founding farms are located in the heart of the Midwest. Most of our current production comes from farms operated by three of our founding members. These farms are located in Northeast Missouri and West Central Illinois. Our cattle are 100% grass-fed and grass-finished and do not receive any starch (grains) in their diet. 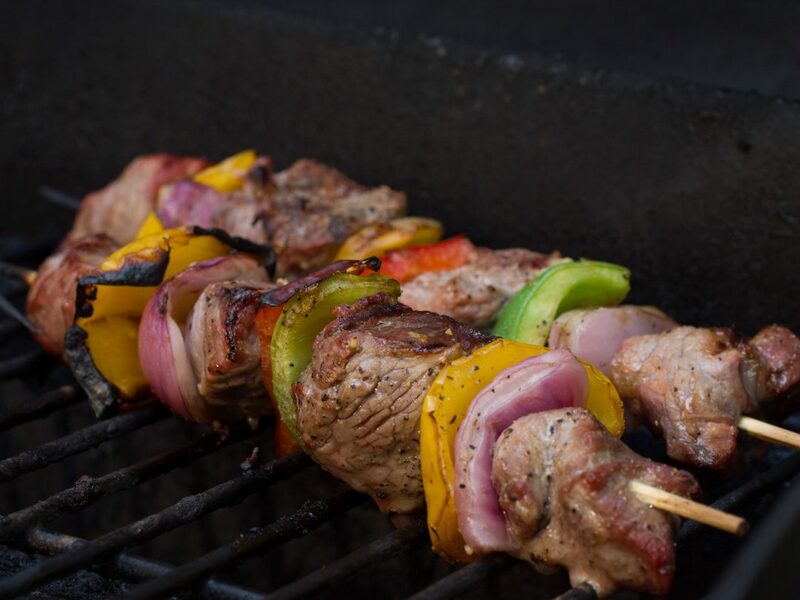 Every beef product – from our steaks to our franks and ground beef – meets this same criteria. We do not feed any antibiotics or hormones to our cattle and no pesticides or herbicides are used on our pastures. Besides our founding farms, we also source from a few private farms throughout the United States and through our partnership with grass-fed farmers in Tasmania. All of our partner farms are thoughtfully and carefully selected and practice sustainable farming methods. 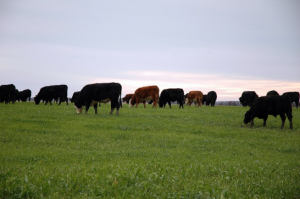 Currently, our cattle farms are located in Missouri, Illinois, Alabama, Montana, and Tasmania. We enjoy long summers with abundant rainfall to keep our pastures green most of the year. We bale plenty of those warm weather grasses in the summer so the cattle still enjoy those same grasses when snow is on the ground in the Midwest region. A small group of Tasmanian farmers came to the US for tours of our farms many years ago, which led to the formation of this unique partnership. Tasmania is the ideal place for grass-fed production due to their temperate climate. 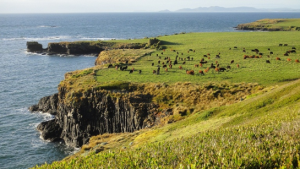 This island is the ideal place for grazing animals, as they have a temperate climate and plenty of rainfall that allows for grazing year round. No GMOs are allowed on the island. They are raising their cattle to the exact standards as we are: 100% grass-fed and grass-finished, not fed any antibiotics or hormones, and the farmers do not use any fertilizers or pesticides on their pastures. Again, these farms are using environmentally thoughtful, sustainable farming methods. We started sourcing product from Tasmania because there are certain cuts that the animal only has so many of – such as skirts, flanks and hangar steaks. Our continuous shortages caused us to reach out to our friends from Tasmania for some of these cuts, which they were able to provide. These primals go through the aging process while they are on the ship here, and they are then processed and packaged with our other raw beef cuts here in Missouri. Click here to learn more about the farm in picturesque Tasmania. Bison: Our bison roam the open pastures of the Dakotas and Northern Plains where these farmers are dedicated to improving the native grasses of the area and ensuring the bison’s natural way of life. 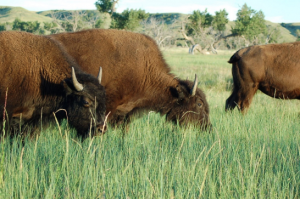 NorthStar Bison in Wisconsin and Wild Idea in South Dakota both raise their bison on 100% native prairie grasses, without chemicals, added hormones, pesticides, or grain. All our bison is 100% grass-fed and grass-finished. Pork: All of our pork products are GAP-certified, meaning they are raised in the best conditions possible. Our pork comes from Heritage Acres which is a group of small, local Missouri and Kansas farmers providing the finest quality, antibiotic-free pork. You can read more details on our pork blog, including information on the pigs diet which is 100% vegetarian feed. They receive no added hormones and are antibiotic free. 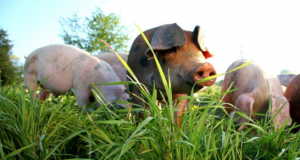 Since pigs have a single stomach, they cannot be raised on grass alone so their diet is supplemented with a conventional, 100% vegetarian diet that includes corn and soy. Since January 2015, the feed is non-GMO. All our current inventory is from pigs fed a non-GMO diet. None of our pork products are processed with or include nitrates or nitrites. Poultry: We source our free range chicken products from a few poultry farms throughout the US. The free range chickens enjoy plenty of fresh air and sunshine while maturing at their natural pace. 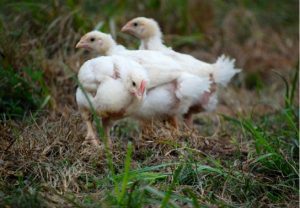 Raising chickens in this way takes a little longer with our birds reach marketable weights in 6-10 weeks as opposed to the industry standard of 6 weeks. Currently, we source from farms located in: South Carolina (bundles shipped directly from the farm), Arkansas, California, and Florida. Once mature enough, the chickens are outside on pasture during the day where they can scratch in the soil, eat green plants and whatever bugs they find. For their protection from predators such as foxes and coyotes, the chickens are moved indoors at night. Because chickens have a single stomach, they cannot be raised on grass and foraging skills alone. 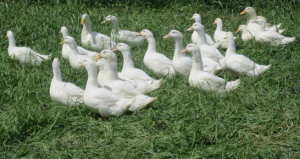 Their diets are supplemented with a conventional poultry diet which includes corn and soy. This all natural feed contains no antibiotics, hormones, or animal by products. We have converted nearly all our poultry options to a non-GMO feed ration. Any selection that is GMO free will specifically be stated in the online description, such as our free-range chicken wings. Due to growing interest and frequent customer requests, Maypop Farm also started raising soy-free chickens in the summer of 2011. These selections may be found in our soy free category. The only soy-free chicken products we currently offer will have “soy free” in the item description and ship directly from our South Carolina poultry farm. The soy-free chicken feed is non-GMO and does contain corn. Maypop Farm in Darlington, South Carolina also raises all of our free range 20 pound chicken bundles and ships those direct from the farm. The following poultry options are free range, but not GMO free: South Carolina chicken bundles (except for the Soy Free bundles, which are GMO free). The following poultry options are not free range or GMO free: Turkey Jerky, Chicken Sausages, and Turkey Provolone Sausage. These selections are free roam and antibiotic free from birth. The diet for these chickens is a conventional poultry diet which includes corn and soy. Dairy: We are very lucky to be able to source grass-fed dairy products, without any added growth hormones. We have two different Amish dairies- one in Indiana, the other in Pennsylvania, who supply us with raw, grass-fed cheese. The ingredients in our raw cheeses (except unsalted cheddar) are: milk, cultures, sea salt (either Redmond or Celtic – depends on variety), and rennet. We do not feed any antibiotics or hormones to any of our animals, and all of our cattle – both beef cattle and dairy cows – are 100% grass-fed and grass-finished, so they are not consuming any grains throughout their lives. They are grazing on pastures free of any sprayed fertilizers or pesticides. The cheeses are not certified organic, but we are sourcing all of them from a group of Amish farmers, raising their animals the same way our ancestors did years ago – organically, but not certified. 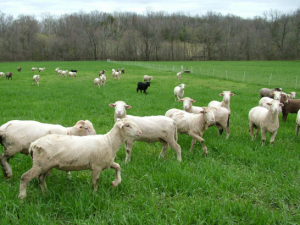 Lamb: Our lamb is raised in Oregon and southern Missouri on a 100% grass-fed diet devoid of any chemicals, hormones, pesticides or grain. The lamb enjoy lush pastures and plenty of rainfall. Seafood: Our seafood products come from Vital Choice located in the state of Washington, one of the premier wild-caught seafood providers in the country. Their products are certified sustainable, and most products are caught off the west coast and surrounding waters. The only exception is our wild-caught raw shrimp which are harvested in the Pacific Ocean and processed in the United States. They are wild-caught and chemical free. We have carefully collaborated with like-minded farmers and individuals that hold their products to the same standards we believe in for our company. Long story short, we have built our business over the many years while respecting our animals and our environment. We enjoy the products, just like our customers, so it remains our goal to offer the best selection possible.